Broadway funnyman Seth Rudetsky came out with his second book last year, Broadway Nights. It's about a broadway pit pianist, Stephen Sheerin who dreams to conduct a broadway show. It was my companion during my long flight to SE Asia over the holidays and made the 20 hr. flight bearable. Actually, the book is such a light read that I found myself trying to read it slowly so I can savour it's deliciousness. 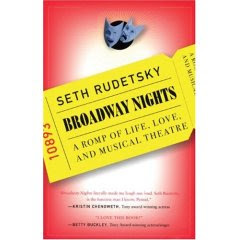 The book is peppered with Seth's hilarious and amusing broadway anecdotes (it's like the movie documentary Show Business meets The Soup). But what I really liked most about it is he takes you through Stephens's adventure into becoming a musical director. It's a behind the scenes look at putting up a broadway musical.....from getting hired as a musical director to the auditions to technical rehearsals and opening night. It's such an arduous process. And all this from the point of view of a musician, which as a theatre geek, I seldom hear or see because mostly all the glory goes to the actor. Makes you realize that it takes a village to put up a show! Incidentally, check out Seth's deconstruction podcasts on the link above because it's a) hilarious and b) it's music appreciation 101.